Auburn is the first of the large antebellum homes to be built in Natchez and was completed in 1812 and is open for tours Tuesday thru Saturday. 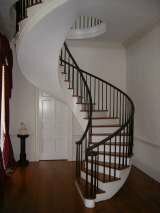 Auburn has a free standing spiral staircase that is one of a few in the United States. The home was built for Attorney Lyman Harding who moved to Natchez from MA. After Attorney Hardings death in 1820, Auburn became the home of the Duncan's until 1910 when it was donated to the City of Natchez. It is now managed by the volunteer members of the Auburn Antebellum Home for the City.